Please visit us at NanoAndMore USA booth no. 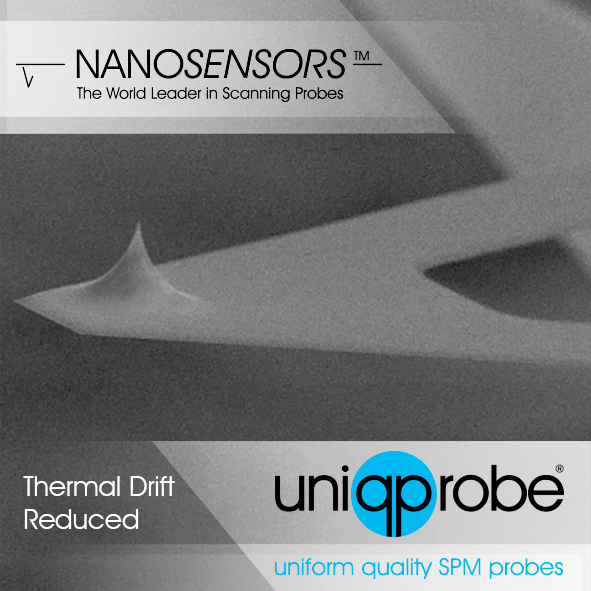 610 at MRS Fall #F14mrs to learn more about our drift reduced uniqprobes for biology and life-science. Again, we got an impressive image from AFM icon Sergei Magonov, NTMDT USA. 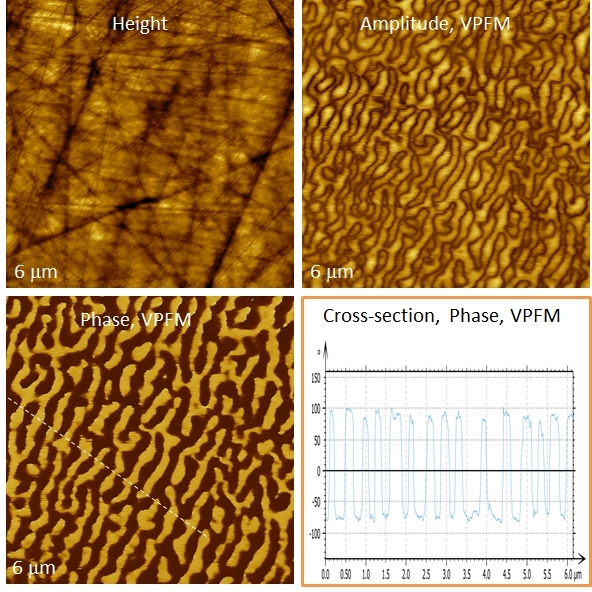 Sergei imaged a Perovskite PLZT sample on NT-MDTs AFM flagship, the Titanium scanning probe microscope in Piezoresponse Force mode using NANOSENSORS Platinum Silicide FM tips. Thank you Sergei for sharing your images with us! Piezoresponse Force Microscopy on a Perovskite Lead Lanthanum Zirconate Titanate sample. Images courtesy by Sergei Magonov, obtained with a NT-MDT Titanium scanning probe microscope. A common problem of probe mounting in the AFM is the re-positioning of the tip after probe exchange. The laser must be re-aligned to the cantilever and eventually the feature of interest must be re-located. For more than 15 years NANOSENSORS™ is offering AFM probes with self-alignment features and alignment chips (ALIGN) to overcome this problem. If the AFM head is equipped with a NANOSENSORS™ alignment chip each probe mounted to the AFM will automatically be precisely aligned to continue experiments without major re-alignments. All NANOSENSORS™ PointProbe® Plus AFM probes are equipped with alignment grooves and will be exactly aligned when plugged into the alignment chip. Now, the PointProbe® Plus XY Alignment Series ensures an identical tip position after probe exchange and extends the self-alignment concept to probes of different type and different cantilever lengths. For achieving a self-alignment in direction along the cantilever axis, the support chips of the XY-alignment series are adjusted to the particular length of the cantilever. The support chip of long cantilevers is shorter. That of short cantilevers is longer. By that, the tip is always at the same position, independent from the cantilever length. The tip repositioning accuracy for different probe types is better than ± 8µm.